The man was allegedly arguing over a man buying a hot dog when he lashed out. An alleged argument over a hot dog devolved into a violent confrontation on the streets of Los Angeles on Saturday. After releasing footage of the incident on Tuesday afternoon, police said a day later they have arrested a suspect. The incident took place over the weekend on a crowded downtown Los Angeles sidewalk just after midnight near Pershing Square. 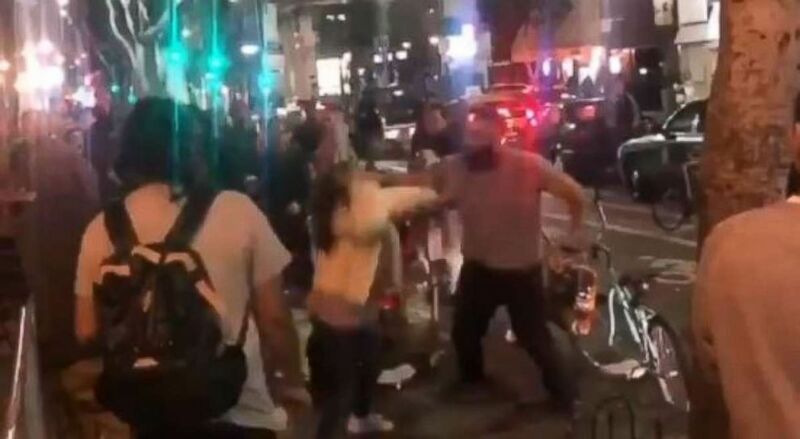 Police said the incident began with the suspect fighting with the vendor at the hot dog cart before he eventually started taking swings at the women. Arka Sangbarani Oroojian, 30, turned himself in to police late Tuesday. Oroojian has been charged with felony assault. He was released on $90,000 bail and is due back in court on Feb. 22. The arrest came after video of the incident, which allegedly shows Oroojian knocking out two women, went viral. "There was a man that was arguing with the vendor. At that point, one of the women said, 'Hey, order your hot dog so we can get our food,'" Los Angeles police Det. Meghan Aguilar, assistant officer-in-charge of media relations, told Los Angeles ABC station KABC. (Los Angeles Police Department) Police are searching for a man who punched two women at a hot dog stand in downtown Los Angeles on Saturday, Jan. 26, 2019. "The man immediately turned, punched that woman in the face," she continued. "That punch caused the woman to lose consciousness and she fell to the ground. At that point, her friend did try to intervene and she was punched multiple times by the suspect." The video does not show the initial argument between the customer and the vendor, but begins with the man throwing a woman in a white jacket to the ground. He then turns and punches a woman in a black shirt and black pants. He turns back to the woman in the white coat and punches her, then back to the woman in black and knocks her unconscious with one punch to the face. The woman in the white coat squares up to the man, but he decks her with a second punch and she collapses. In total, he threw at least four punches, two at each woman. The man can then be seen in the video running into the street and away from the scene. Police released the cellphone footage on Tuesday, saying, "Someone knows him, and we would like to be one of those people." The two women were taken to the hospital, treated for concussions and released. The man is described as being about 6-foot-2 and 225 pounds. Police asked for anyone with information on the suspect to call 213-996-1851.